I'll admit it. I'm a podcast junkie. When I'm gardening, I listen to gardening podcasts. When I'm knitting, I listen to knitting podcasts. When I'm cleaning/decluttering/organizing, I listen to cleaning/decluttering/organizing podcasts. Right now, I'm hooked on a podcast called Organize 365 and one of the podcasts I listened to this morning was about seasonal energy. Lisa Woodruff, the host, was explaining how our energies vary throughout the year. In January, everyone wants to get organized. In March, we all want to clean and declutter. May brings planning for the summer months and so on. Most of her descriptions described my seasonal energies exactly. This got me to thinking about my seasonal creative energy. I've noticed through my GoodReads challenges, I read 70% of all the books I will read in a year in the first third of the year. This is also the time when I complete most of the lessons in Life Book or any other online mixed media classes I may be signed up for. In the summer, I knit. This is mostly because we're in the car a lot with baseball tournaments and it's a good way to pass the time. Also, because I live in Florida, I only knit socks and lace so that's really portable. 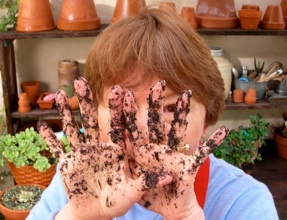 Gardening happens in the summer which is the wrong time to be doing that down here! This year, I've been making a concerted effort to change these patterns. Instead of turning on the TV when I wake up in the middle of the night, I'm turning on my Nook and reading. I have made from 2-4pm each day my creative time and I'm spending at least one hour each day in the garden. I know we're still in the first third of the year, but I'm hoping that by making these dates with myself, I can create new patterns while still conceding to living the "normal" energy flows throughout the year. And that's what I'm thinking about today.